A revocable living trust or revocable trust is a form of “will substitute” that effectively can avoid the costly and very public probate process. The revocable living trust also serves as a receptacle for any assets that are not owned by the trust at your death, and may be the most significant document in your estate plan. If you are married, your trust may contain separate provisions for funding a so-called “credit bypass” trust (also known as a “Family Trust”), which will allow you to take advantage of the current lifetime exclusion from your estate of $5,340,000 (in 2014). The trust also may provide for a separate “marital” deduction gift or trust to minimize taxation on the death of the first spouse. Please note that the revocable trust also can be drafted to permit specific bequests of money or other property to your heirs, friends and family, or charity, or to accomplish myriad other goals. To create a “funded” revocable trust, you will need to re-title certain assets currently held in your individual or joint names into the names of the two trusts. You should try to ensure that all of your assets (except perhaps your house, which we understand is owned as joint tenants or tenants by the entireties) are owned by the revocable living trusts to avoid the very costly and public probate process in Virginia. You may decide to use a revocable living trust instead of relying on a will or joint ownership or some other form of property ownership in your estate planning. Revocable living trusts may provide significant cost and time savings for your heirs. In addition, living trusts may provide significant benefits in the event of your incapacity and portability if you are moving from state to state. Just preparing these trusts is not enough. You actually need to put your assets in the trusts. This is known as “funding” your trusts. Many people forget this critical step. Funding your trust is transferring ownership of your assets from you to your trust. You physically change the titles of your assets from your individual name (or joint names, if married) to the trustee of your trust. You also will change the beneficiaries’ designations on life insurance, retirement assets and other types of assets to your trustee. In the case of living trusts, you typically will be your own trustee so the change in ownership will be simple and won’t have any adverse affect on you. Who Controls The Assets In My Living Trust? The trustee of your living trust will control the assets in your trust. Typically, you will name yourself as trustee of your own living trust. In that case, you will have complete control over the assets in your trust. As a result, you will be able to buy, sell and transfer assets in the same manner as you currently have the ability to do so. You can also add or remove assets to your living trust at any time while you are serving as trustee. Why Do I Need To Fund My Trust? If you have gone to the expense and effort of having revocable living trusts prepared, but haven’t changed the title to your assets or the beneficiary designations, your assets will still go through the probate process. This process (depending upon the state) entails preparation of inventories and annual accountings, among other things, that may result in significant costs and time delays to your heirs. In addition, the probate process generally is a public one, giving anyone the ability to see the assets you owned at your death. So, if you have drafted your trust but have not funded it, it will not control anything until your death, in which case all of your assets will still go through the probate process or will not pass according to your wishes as set forth in the trust. In other words, fund your trust now, rather than having a court do so later. What If I Forget To Transfer Assets To My Trust? To accompany the trust, we always prepare a “pour over will” that causes any forgotten assets to pour over or be transferred into your trust at your death. While this does not avoid probate, it at least ensures the assets will pass under your trust and in accordance with your wishes. Can Odin, Feldman & Pittleman Help With The Funding Of My Trust? Odin, Feldman & Pittleman, P.C. offers a detailed funding program for all clients that utilize trusts. We have paralegals who act as funding coordinators for purposes of ensuring that assets are transferred to your living trusts. We will give you the option of allowing us to perform the entire funding function or splitting duties and responsibilities between you and Odin, Feldman & Pittleman, P.C. This will be agreed upon in the initial engagement letter and we will provide you with an estimate of fees or fixed fees for our handling of any portion of the funding process. Certainly, you can save on legal fees if you assume some of the responsibility for the funding process, but we want to make sure that it gets done in any case. The funding process is not difficult, but it can be time-consuming and detail-driven. In fact, living trusts are now so commonly used that most banks, investment brokerages, title companies and real estate companies understand how the funding process works and generally will be cooperative in assisting you in transferring assets to your trusts. In some cases, the institution will want evidence that your trust exists. In Virginia, we can use a “certificate of trust” to provide this evidence. Many institutions have not modernized their compliance systems to accept certificates of trust, so they may request copies of portions or all of your trust. It usually is unnecessary to provide a copy of the entire trust to an institution, although some may request this for their files. The certificate of trust is a simple one-page document that verifies the trust’s existence, explains the powers given to the trustee(s), identifies the trustees and may include certain other information without revealing private information that may be included in the trust instrument. While the funding process may not be difficult, many clients procrastinate and do not complete the process on a timely basis. That is why we will be in touch with you periodically to ensure that the funding process has been completed either by us or by you. In the future, after you have done the initial transfers of property into your trusts, the funding process is relatively easy. Just remember to title assets in the name of your trusts as you purchase new properties or open new accounts at financial institutions. Should I Put My Real Estate Into The Trust? Because living trusts do not generally provide asset protection benefits to you while you are living or even incapacitated, many commentators have recommended that clients not put real estate into the trusts. In Virginia, the opposite is true. We have a statute in Virginia that permits married couples to retain the same asset protection they enjoyed while owning property outside of the trusts as tenants by the entireties. In other words, if a married couple transfers property that they owned together (i.e., as tenants by the entireties), the trust will enjoy the same asset protection they enjoyed outside the trustMaryland recently passes a similar statute. Outside of Virginia and Maryland, particularly in D.C., this rule does not yet apply. Therefore, you may want to be selective in placing real estate into your trusts if asset protection is your paramount concern. On the other hand, if you are not concerned about asset protection and your primary concern is to avoid probate and provide for your incapacity, then transferring the real estate into your trusts is a must. Also, some lending institutions require you to title the property initially in your personal name, but will permit you to transfer real estate into your trusts after the initial deed is prepared and recorded. In fact, federal law allows you to transfer mortgaged property that you use as your principal residence into your revocable trust, provided the trust has certain powers and the trustee is able to exercise those powers at any time. We draft our living trusts to comply with these requirements automatically. Make sure your homeowner, liability and title insurance policies also are changed to reflect your trustee as the new owner of your real estate. Most importantly, owning your real estate in trust will enable you to avoid ancillary probate in states in which you do not reside. This is an important consideration in deciding whether to use revocable living trusts, and frequently causes clients to decide on the use of living trusts rather than wills. If the real estate has been contaminated (e.g., from underground storage tanks or chemicals leaching into the soil from the prior owners), you can still place the property into your living trust, but your trustee may be held personally liable for any clean up costs under environmental protection laws. If you are the trustee, this point is irrelevant, because as the owner you are already responsible. But if a successor trustee steps in after you are gone, the successor trustee will be concerned about environmental liabilities that may be associated with the property. There may be better alternatives for the property ownership than putting it into a living trust in such limited cases. 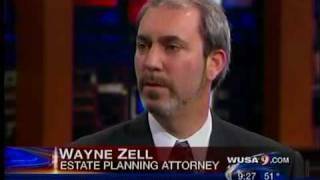 What If I Come From A Community Property State? Many of the Midwestern and Western states (e.g., California, Texas, Arizona, Nevada, etc.) are community property states, where each spouse is deemed to own one-half of the other spouse’s assets, with various exceptions. You can continue community property status in a living trust. Moreover, you can move from a non-community property state into a community property jurisdiction (and vice versa) without the need to re-do your trusts, provided special language is included in the trusts at the inception of drafting. There may be special tax considerations that cause you to retitle jointly held property as community property first, before titling it in the names of living trusts to achieve a step up in tax basis of the property. We will draft your trusts flexibly to ensure they can be moved to community property states. Do I Have To Put My Car Into The Trust? Unless the car is valuable or antique or substantially affects the value of your estate, you probably do not want to go to the effort of titling the car into the name of the trust. First, waiting lines at the local department of motor vehicles make it an extremely burdensome process. Second, departments of motor vehicles typically do not understand the living trust relationships and it may not be worth the effort of retitling a car, a depreciating asset, into the trust. More importantly, the impression created by owning a car and a living trust may be that you have significant other assets that may be available for the claims of creditors, that may arise out of an automobile accident. Consequently, we typically do not advise our clients to put cars into the living trusts. This is probably one of the only exceptions to the general rule of titling all of your assets in the name of the trust. How About My Retirement Plan Assets? For married individuals, we often name the surviving spouse as the primary beneficiary of the first spouse’s retirement plans, which include individual retirement accounts, 401(k) plans and other qualified retirement plans. This is because significant income tax savings benefits are obtained from this type of naming convention. The retirement plan itself is never transferred into the living trust. Rather, the trust may be named as a secondary or contingent beneficiary of the trust. In addition, for single individuals, we almost always recommend, depending upon the size of the estate, and the size of the retirement plans, that the individual consider naming the living trust as his or her retirement plan’s primary beneficiary. In certain cases, because of a desire to be able to accumulate retirement plan distribution or move to a community property state, but still qualify for the benefits of stretching the retirement plan payout over the life expectancy of the beneficiary, we may recommend that a separate retirement beneficiary trust is utilized (in addition to the revocable living trust). We will consult you about this when we gather your information for your estate planning consultation. 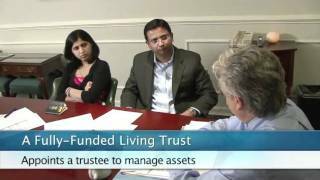 Are There Any Other Assets That Should Not Be Placed Into The Living Trust? In addition to your automobiles, certain small checking accounts and perhaps a personal residence, we typically do not recommend that you put incentive stock options, section 1244 stock and professional corporation stock into a revocable trust. Doing so may jeopardize beneficial tax treatment or may not be permitted under the state statutes (particularly with respect to professional corporations or professional limited liability companies). In addition, certain federal government contractors with special status (e.g., 8A or disabled veteran-owned entities) may not be able to transfer their shares or ownership interests in such entities into a living trust. We will be glad to check on these issues when you come in for your estate planning consultation or during the estate planning process.